Received copy from publisher for review. I absolutely love this book, it's a new all time favorite! Going into the book I was worried that Fiona was going to be more of a 'pity me' type story and Fi was going to be this fairy tale version, but it totally was NOT that at all. Both versions of the main character's story are inspiring, brave, honest and raw. I immediately fell in love with Fiona's humor and personality. Fi took a bit to grow on me, but I think that was a super important part of the story. Throughout the book you can so clearly see both versions of the character grow. I adored the sibling relationship between Ryan and Fi/Fiona's. It was interesting to see the changes and similarities in their relationship between the two versions of Fi/Fiona. Even though there were differences, you could still see how much they loved and cared for each other. The book really focuses on the lives of Fi and Fiona, but there's also some cute boys thrown into the mix. I think there was the perfect amount of love interests without taking away from the importance of the main characters' stories. "I live with my parents, play for a terrible lacrosse team, take classes I don't care about. I'm just barely treading water here!" "So grab a vest, Fi." Everything That Makes You talked about the big 'what if' of life and how it can change in an instant. Moriah McStay transported me into Fi/Fiona's world with her beautiful writing and amazing storytelling. The story is relatable, memorable and just all out incredible. 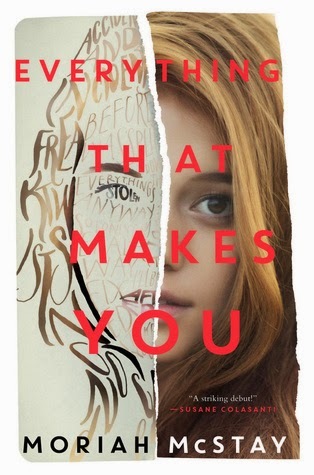 Everything That Makes You is an innovative coming of age story that demands to be read. I highly recommend! **I received this book for review from HarperCollins in exchange for an honest review. All thoughts and opinions expressed are my own. I like that Fiona's story was not a pity me story because it could easily fall into that territory and Im glad there are cute boys in the mix, that cannot go missing, lol.